It mIght be obvious to you that we have a slight obsession with sweets. Okay, perhaps it’s a little more than slight—it’s pretty severe. But there is just something so satisfying about them! I mean, who wouldn’t want to start their day by pouring hot chocolatey nutella syrup over crispy banana waffles first thing in the morning? After a breakfast like that, it’s basically guaranteed that the rest of your day will be spectacular. Life is full of bountiful pleasures like these, and it’s important to treat yourself to sumptuous breakfasts from time to time! 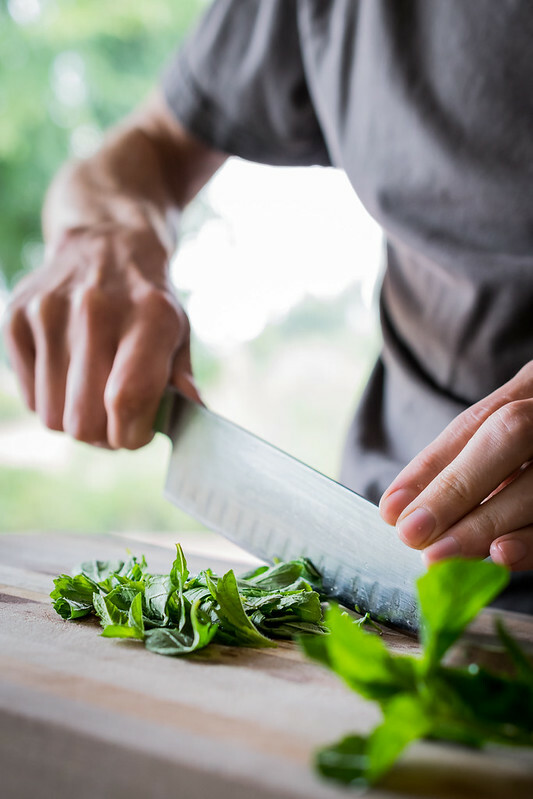 We are not saying that you should then go have cake for lunch and ice cream for dinner, but keeping a diverse mix of sweet and healthy is important. When we were planning this month’s blog schedule, we realized that four out of the last five recipes we posted were desserts and the fifth one was a cocktail. 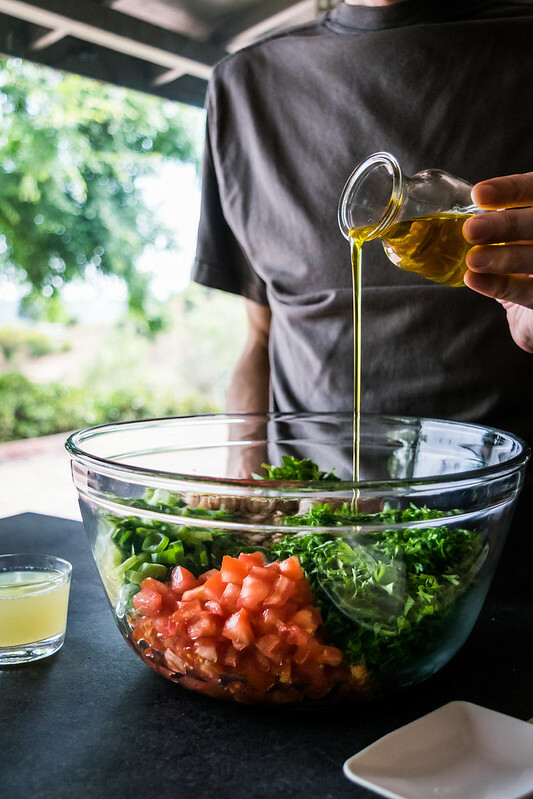 So today we are balancing things out and sharing one of our favorite Mediterranean side dishes, a delicious and healthy cold salad, perfect for all your spring and summer entertaining needs. 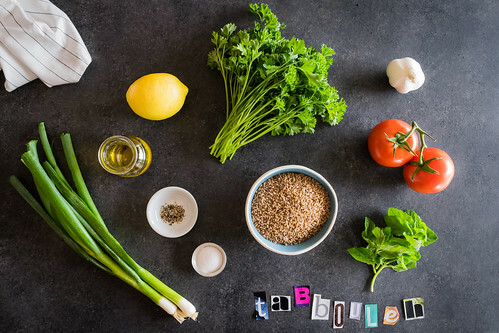 Say hello to tabbouleh. We love going out for Middle Eastern food. There are plenty of tasty vegetarian options, so it is a fun change for us to actually read a menu instead of skipping through everything quickly to find the lone veggie burger. We can order a variety of items and fill our plates with colorful and delicious choices. Crispy falafels with zesty hummus and warm pita bread make a satisfying main course, especially when served with smoky moutabal and garlicky muhammara. 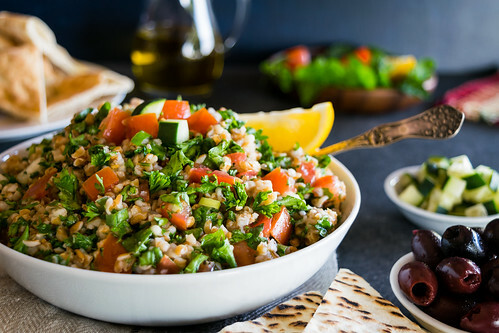 Here, fresh mint and parsley are tossed with chopped tomatoes and scallions, boldly seasoned with raw garlic and lemon juice, and mixed with the nuttiness and chewy texture of cooked bulgur wheat. 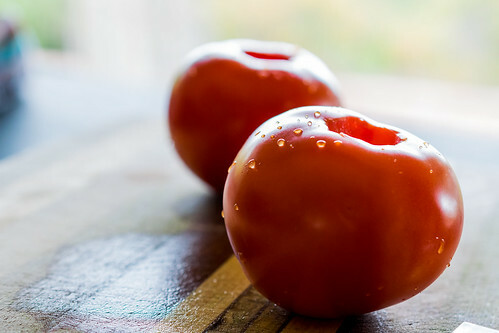 Simply spiced with a little salt and pepper, this zippy appetizer is light, flavorful, and nutritious. 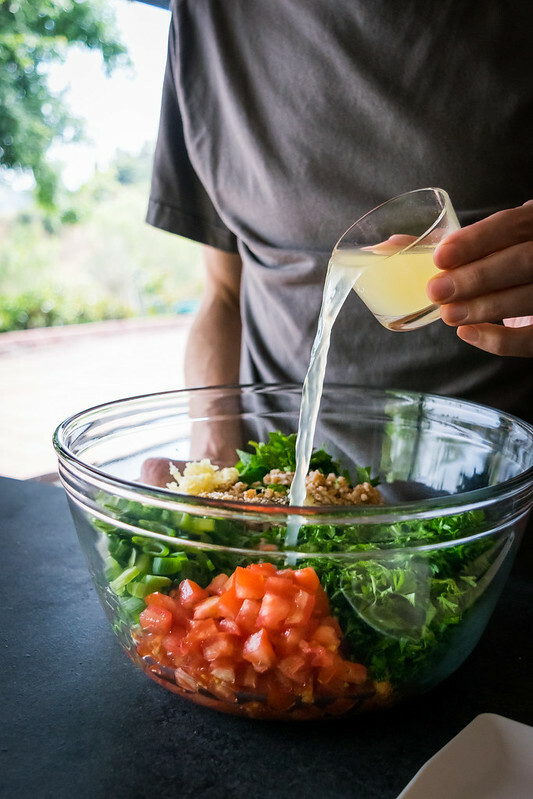 This tangy salad comes together in no time. 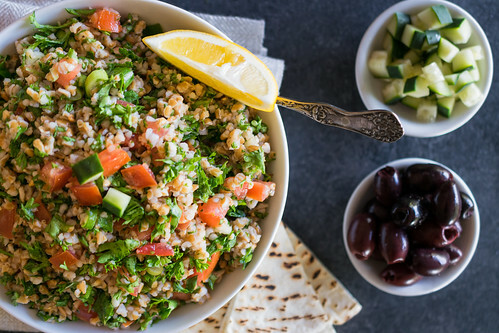 The bulgur wheat cooks in about ten minutes, then everything gets tossed together in one bowl. 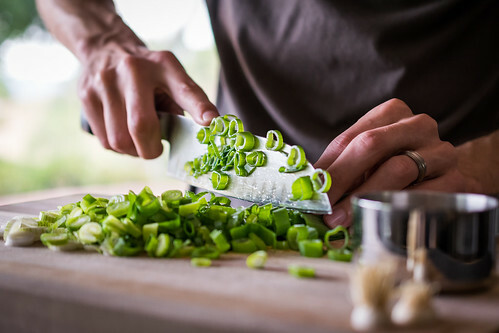 It couldn’t be easier to make, and the preparations are guaranteed to stimulate your olfactory epithelium once you start chopping these aromatic ingredients. 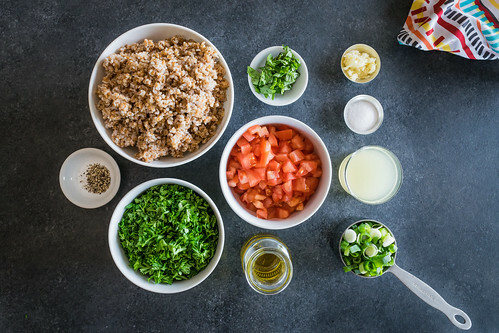 Tabbouleh makes a wonderful lunch, a quick and easy side to go along with dinner, and a delicious healthy choice to bring to your upcoming pool parties… just remember to keep things in balance and also bring a tray of these chocolate peanut butter brownie cups! 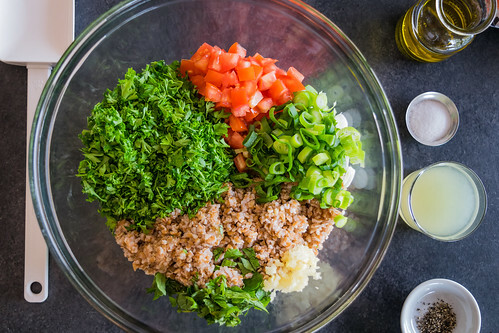 In a small saucepan, combine the bulgur wheat and water. Bring to a boil, then cover pan, turn heat to low, and simmer for 12 minutes, until tender. Drain into a fine-mesh strainer, fluff with a fork, then transfer it to a large mixing bowl. Add the remaining ingredients, and toss well to combine. Taste for lemon and salt, and adjust as needed. Serve immediately, or refrigerate until ready to serve, and enjoy! 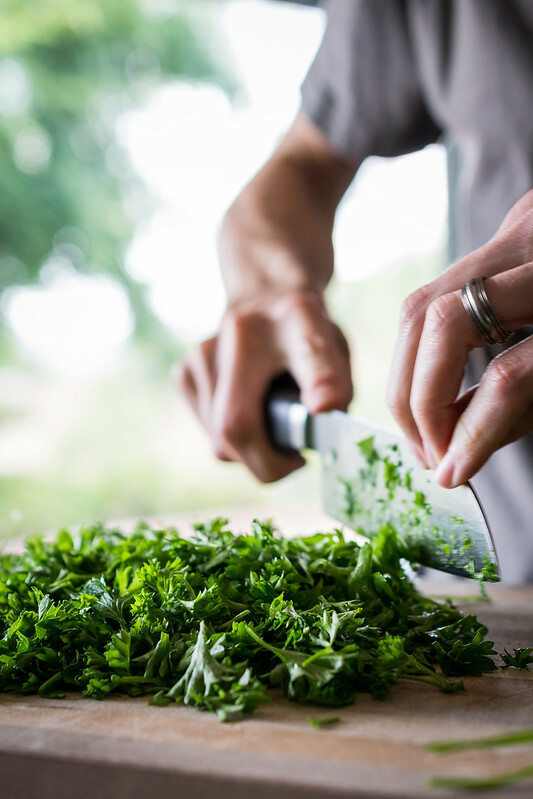 — The tabbouleh is best and freshest on the day it is made, and can be refrigerated for several hours before serving if needed. It is still delicious on the second day, however the texture will by slightly less crisp. 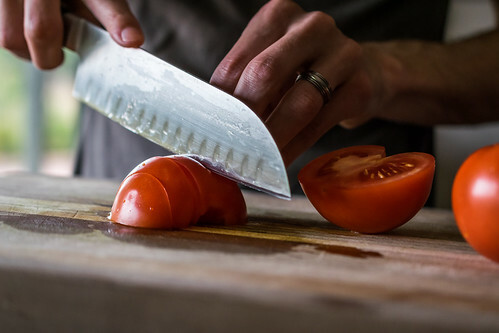 — To make this gluten-free, simply substitute a gluten-free grain such as quinoa for the bulgur wheat.